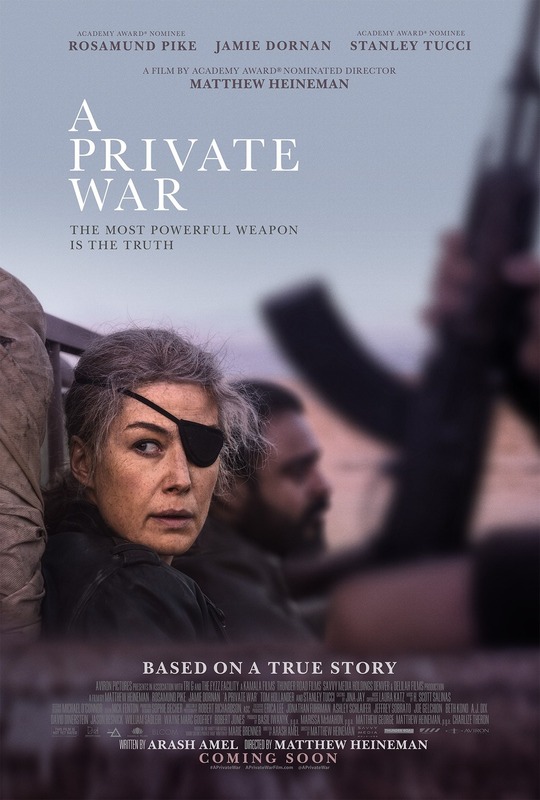 Rosamund Pike tackles the life of war correspondent Marie Colvin, who covered a decade of Middle East conflict, and paid for it with her left eye, alcoholism, and a bad case of war PTSD. Colvin cut a dashing figure with her eye patch and brusque manner, which Pike works to capture. The script often falls into clichés, including the one about journalism as the first draft of history. Pike attempts to reconstruct Colvin's voice, but the result sounds a little like Murphy Brown. The contrast of her dangerous work and hard-driving social life gets exhausting. There's a good story in here about a brave woman, that doesn't quite emerge. "A Private War," rated "R," 1 star. Does it deliver what it promises? War Story that goes for the clichés. Is it entertaining? Hard to watch. Is it worth the price of admission? Not a hit, but rather a miss.